In today’s blog post I want to share with you an experience I had last year in June when I visited Duesseldorf’s Aquazoo. 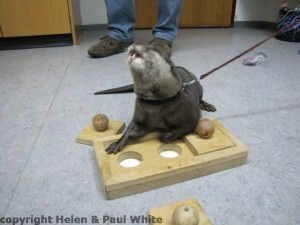 Months before I had “friended” a tame otter named Nemo on Facebook along with his owner, Dr. Wolfgang Gettmann, the recently retired Director of the Aquazoo. Herr Gettmann playing with Nemo. 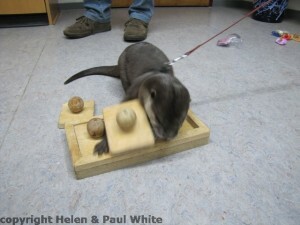 Nemo is an eight year old Asian short-clawed otter who was adopted by Wolfgang as a pup because his mum couldn’t care for him. Nemo has since become a media star not only in Germany, but also an international social media phenomenon – at the time of writing he has 2893 Facebook friends. The cute chap has posed with many of Germany’s celebrities including model Eva Padberg and TV stars Verona Pooth and Guenther Jauch. 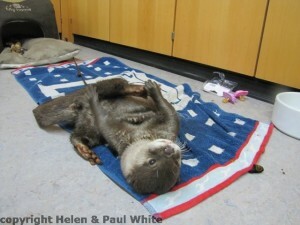 Apart from being famous he also fulfils the serious role of being an international ambassador for all 13 otter species and he accompanies Wolfgang on his various appearances to raise awareness for the International Otter Survival Fund. Nemo looking very flat and super cute. Nemo lives with Wolfgang and his family. He also grew up with Laika, a German shepherd, with whom he formed a close bond. Sadly, Laika died in 2011, but not long after her death Balou, a Hovawart puppy, was brought into the family to cheer Nemo up. Nemo not only enjoys walks on a harness with Balou, but Wolfgang, an enthusiastic canoeist, also takes him on his canoe trips. 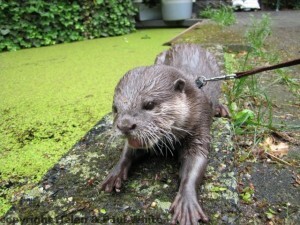 On these trips he is allowed to swim on a long leash. You can find a video of Nemo in action here here. Back to meeting Nemo – when we planned our visit to Cologne I emailed Wolfgang and asked if it was by any chance possible to meet Nemo in person – mainly because I noticed a few people on Facebook have done so, and Duesseldorf is only half an hour’s train ride away from Cologne. He kindly wrote back and invited us. I couldn’t believe my luck and privilege. Knowing that Nemo loves chewing on baby’s dummies we bought some as a gift. When we arrived at Aquazoo we had more than an hour until the scheduled meeting, so we had a look around first. The Aquazoo has an impressive variety of exhibits representing different aquatic environments. 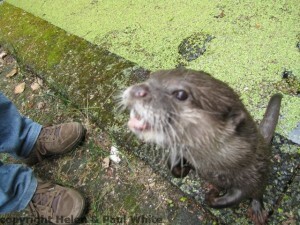 Highlights include a vast shark tank, a tropical hall stocked with reptiles and of course an otter enclosure. And then at 3pm we got to meet Nemo. 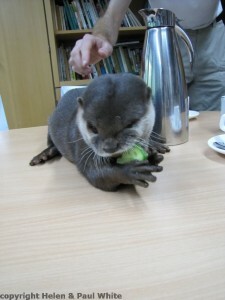 He had just woken up and was enjoying a snack of cucumbers. It’s really hard to describe the cute noises he makes. 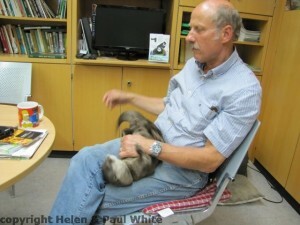 Wolfgang offered us coffee and we sat down in his office to have a chat about all things otter. We found out a lot of things about Nemo too. Looking around in his office it was clear that Nemo is indeed the boss! Look who’s the boss here. He even has his own cat basket to sleep in! After our chat it was time for a wander outside. playing with Paul’s plastic tube. 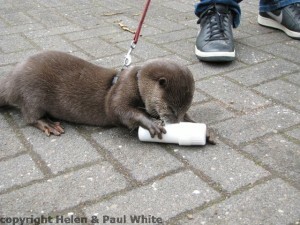 He got dressed and an intern picked him up for his stroll around the Aquazoo’s outside area. 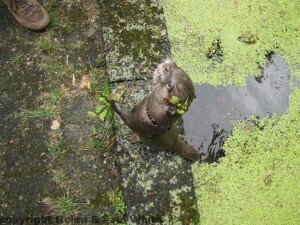 At one point he jumped into a pond covered in duckweed and had a good swim and hunt around. Wolfgang joined us to tell us the story of a Japanese visitor who managed to fall into that pond! 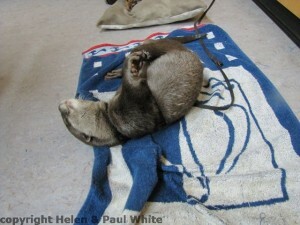 Back inside we were treated to the unusual sight of a wet otter rubbing himself dry on a towel. 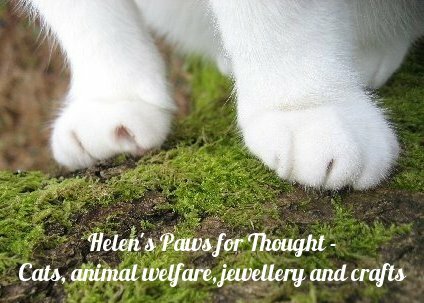 We also had a go at play-fighting – something I wouldn’t necessarily recommend – while his paws are soft and very dextrous, his jaw is incredibly strong – and when he even playfully bites you it does hurt! Wolfgang also showed us Nemo’s find-the-food game. 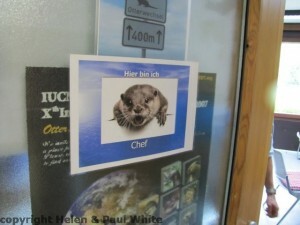 We spent about two hours with Nemo and Wolfgang, who also provided us with some otter related literature and a Nemo dvd. Before we had to say goodbye we also had the privilege to have Nemo on our shoulders. It was a strange feeling having this cute warm and still slightly damp creature breathing close to my face. He didn’t wriggle much – unlike our cat! Instead he was ever the professional and didn’t mind at all! 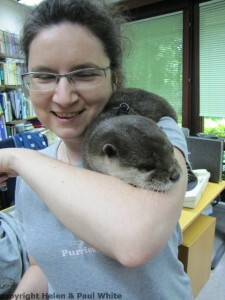 A very cuddly and soft otter. And then sadly it was time to go. We very much enjoyed our encounter – a truly pawsome experience. 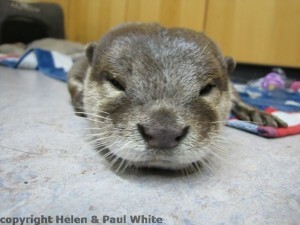 Nemo is an Asian short-clawed otter – the smallest of all otters. Their social structure revolves around one pair of Alpha pair which breeds, while the group helps out with the rearing of the pups. Loss of habitat and pollution means that this species is regarded as vulnerable and included in the IUCN Red List of Threatened Species. 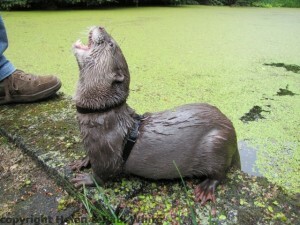 This otter species has a long tail which forms on-third of its total body length. The tail is incredibly strong and used for balance when standing up, propelling the body through water as well as steering. The base of the tail also has subcutaneous and scent glands. 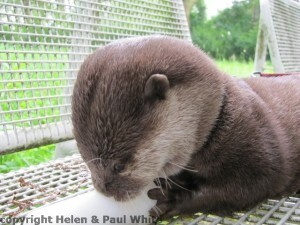 Asian otters are monogamous and the female can produce two litters a year – giving birth to up to six pups. 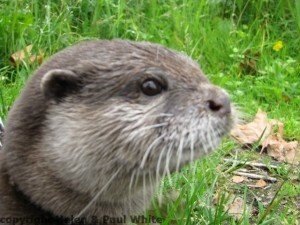 Otters of this species can get between 11 and 16 years old. Update 12/11/2018 – Sadly Nemo died of cancer on the 20/2/2018 . He would have turned 13 on the 22nd of November. 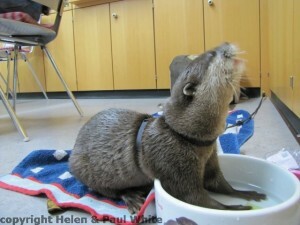 Nemo was well loved all over the world and had a very fulfilled and happy otter life. 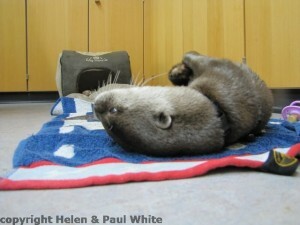 He also contributed as as an ambassador for all otters worldwide. We all miss him. He was a special little guy. Yes it was.You don’t always get so close to an animal that normally lives in the wild. I also once met a bunch of meerkats in a wildlife park in England. That was so much fun. Although obviously seeing them in the Kalahari desert would be even better.